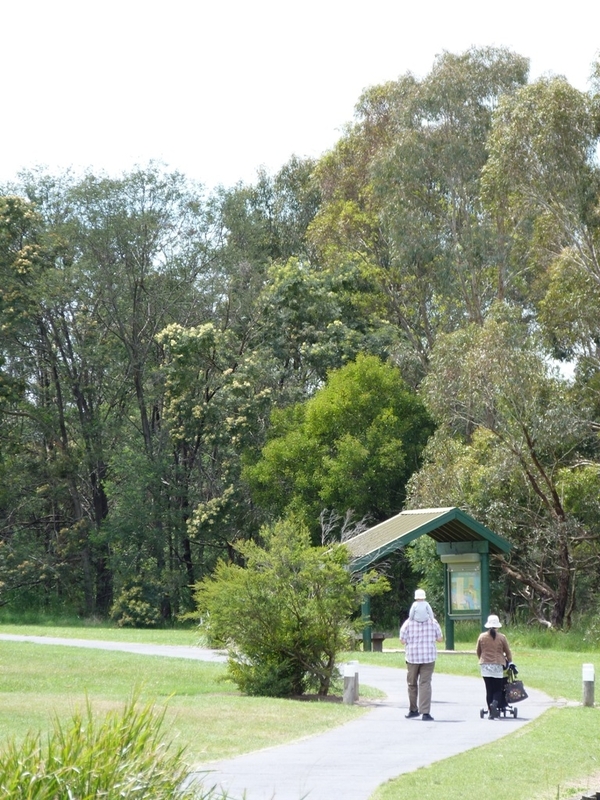 A very popular and gentle walk that includes beautiful open parkland, lakeside views, abundant birdlife, and lush wetlands. Dogs on lead allowed in some areas. 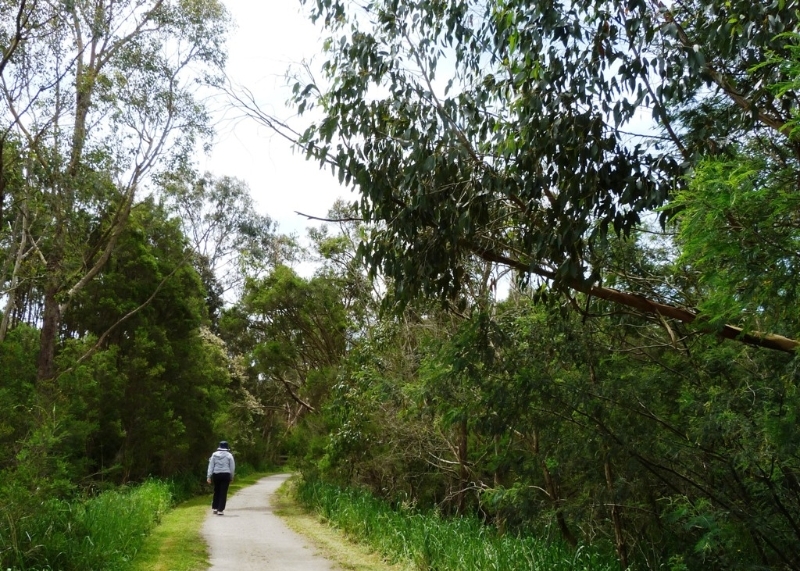 A very popular and gentle loop walk that includes beautiful open parkland, lakeside views, abundant birdlife, and lush wetlands. Dogs on lead allowed in some areas. This walk starts and ends at the visitor's centre. The route uses a combination of sealed and gravel path. It is very level for most of the walk. From the visitor's centre head down towards the lake, turning left when you reach the lake. There are beautiful views across the lake, and you are sure to be greeted by local ducks. But please do not feed them. The lake was constructed in the late 1970s. 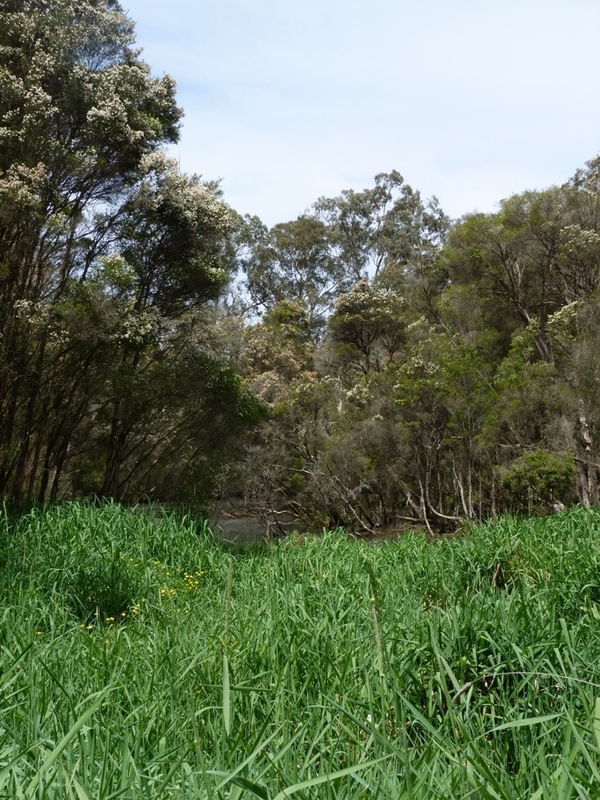 It acts as a flood basin for the Dandenong Creek and provides a great home for native plants and animals. After you pass the lake, take the first right, across a small bridge. From here you enter the fenced off conservation area. The conservation trail winds through some beautiful wetland. Along the way, you are sure to spot some of the abundant birdlife. Over 150 bird species either live in or visit the park. There are cormorants, herons, coots, native ducks and the elegant pelican to name a few. During the warmer months of the year a number of birds migrate to Jells Park from China and Japan to escape the cold winters of their homelands. Along the route, the bird hide is a perfect spot for a quick rest. You have time to catch your breath while observing the local birdlife. After you leave the conservation area, continue north along the lake shore and turn left back up the hill towards the visitor centre. Before reaching the visitor centre, take the first left and follow the path through more beautiful parkland before passing behind the playground. Cross the road and follow the path around to the visitor centre. Dogs not allowed in the conservation area. Facilities: The park has a visitor's centre, restaurant and toilets. 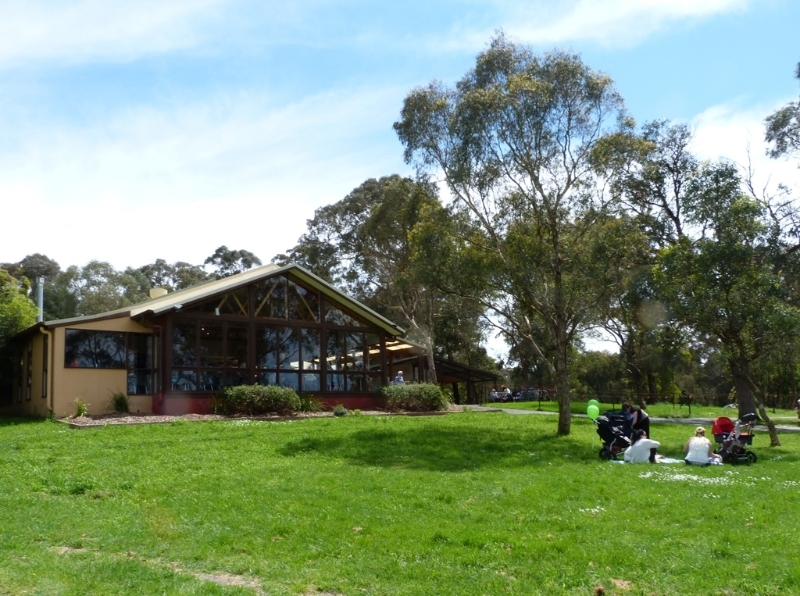 There are several BBQ and picnic areas dotted around the visitor's centre. Bring along a picnic to enjoy after your walk. Along the walking route there are two drinking-water fountains. Access: By Train/Bus - Take the Glen Waverley line train to Glen Waverley. Then take bus route 754 towards Rowville. Get off at Jells Rd/Heysham Drive. The entrance to the park is just south of the bus stop. Notes: The gates open at 8am daily. Check closing times at the visitor centre. This walk includes the conservation area. Please note that dogs on leads are allowed in the park, but not in the conservation area. We start the walk from the visitors centre that overlooks Jells lake. The restaurant is open every day except Christmas Day. 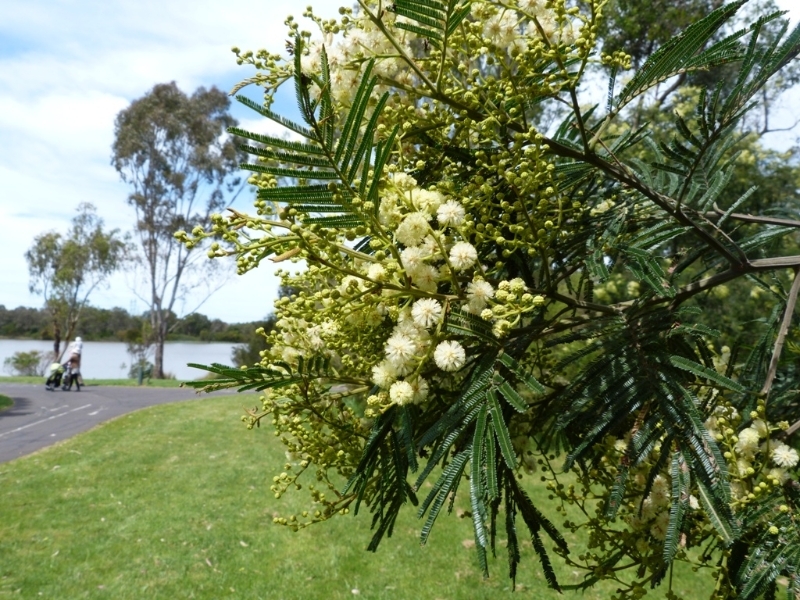 As soon as you start wandering down to the lake you will notice some wonderful native flora to your right. 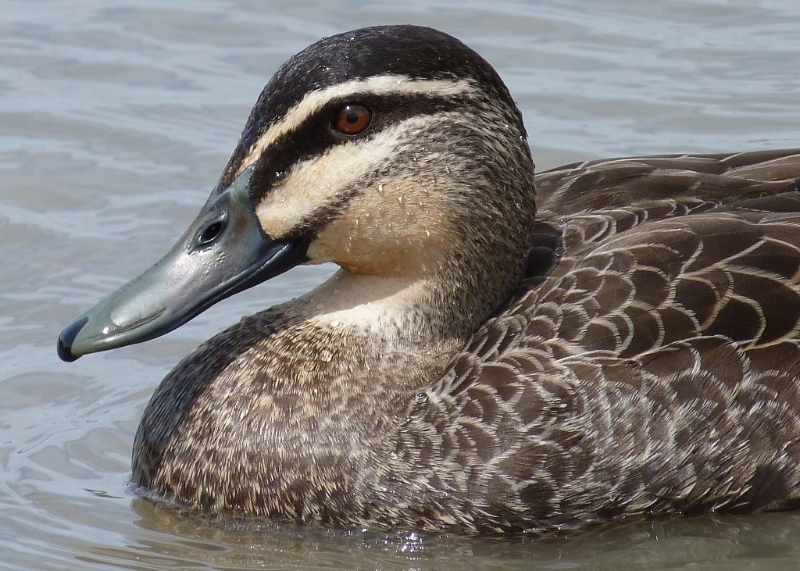 Around the lake there is abundant bird life including the versatile Pacific Black Duck. It frequents all types of water and is found in all but the most arid regions of Australia. 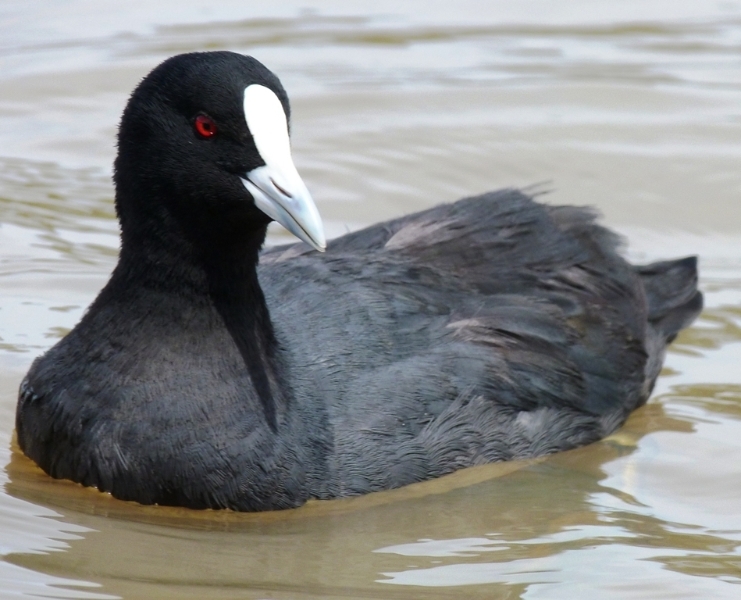 The Eurasian Coot is easy to find. Its an omnivore, and will take a variety of small live prey including the eggs of other water birds, as well as algae, vegetation, seeds and fruit. The path meanders along the edge of open parkland before heading into the conservation area. When you are near the lake listen out for some of the thousands of frogs that live here. They do not drink water, and instead absorb it through their skin. 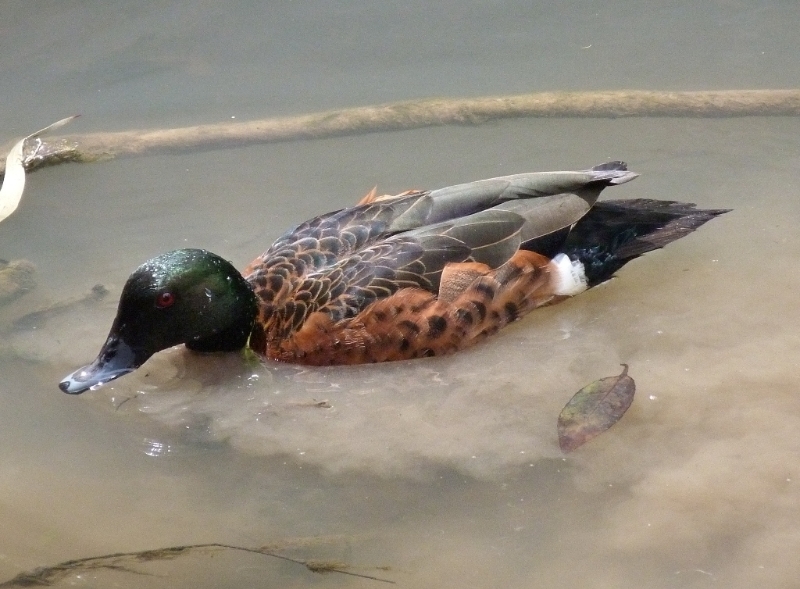 When you are crossing the creek you might spot a Chestnut Teal looking for lunch. 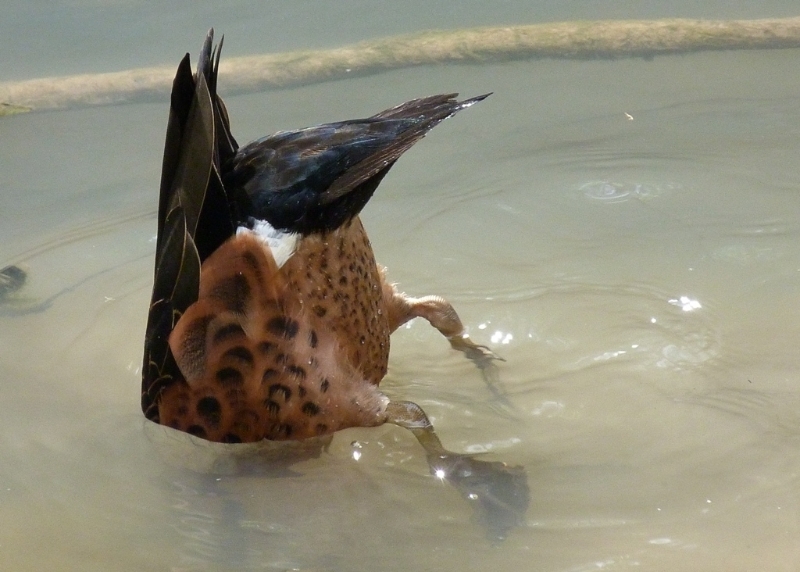 A male teal is pictured here agitating the shallow water ..
.. before upending to bottom feed underwater. The wetlands act as filters, sponges and reserves of water. 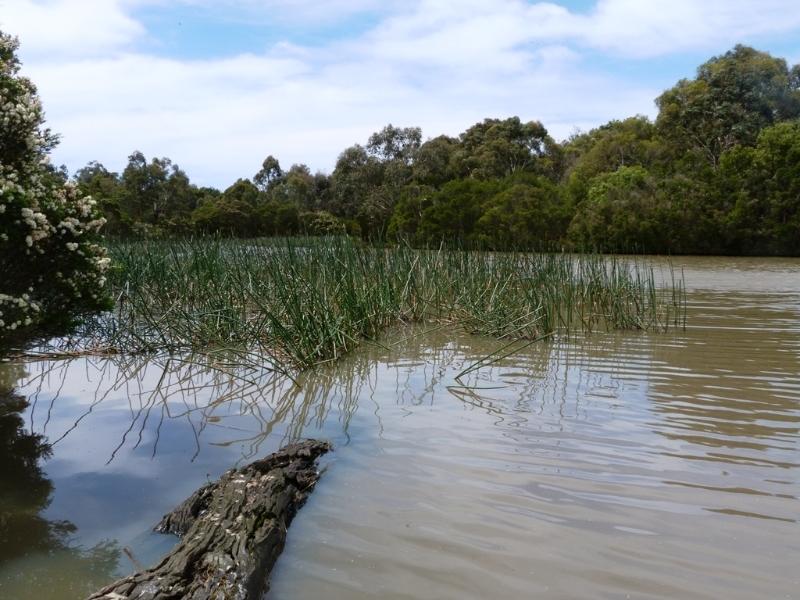 Though only 2% of Victoria is wetland area, it supports 33% of our endangered plants and is home to mammals, frogs, fish and insects. Hollows in old trees are home to many native birds. 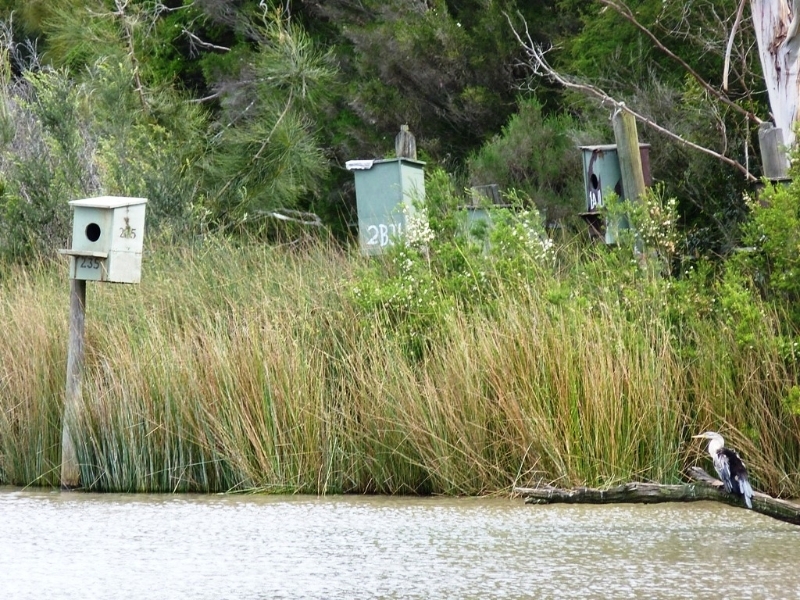 As there are not enough hollows for all the native species that utilise the nesting boxes dotted around the park. The conservation area immerses you in native flora, while you are serenaded by the varied songs of the birdlife it supports. 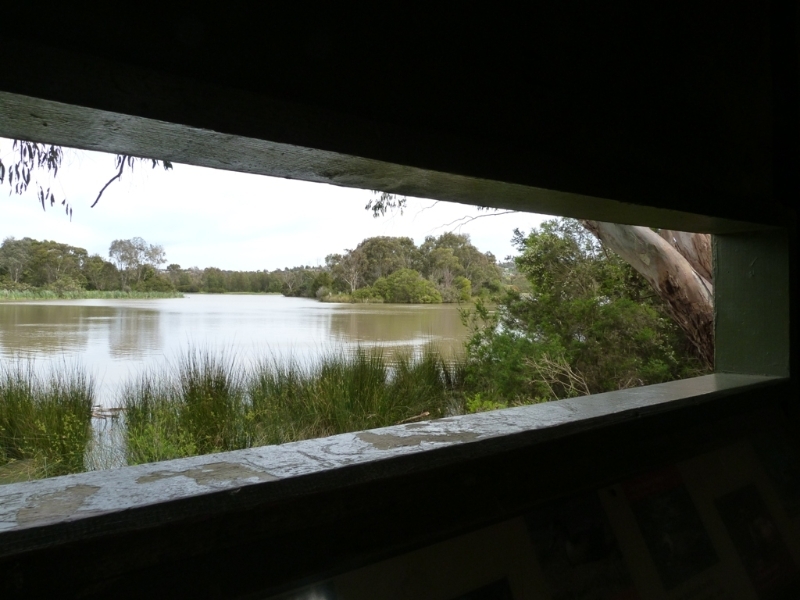 The bird hide provides a great opportunity to watch the birdlife. The hide has an information board with pictures and descriptions of some of the birdlife you may see. Bring your binoculars! 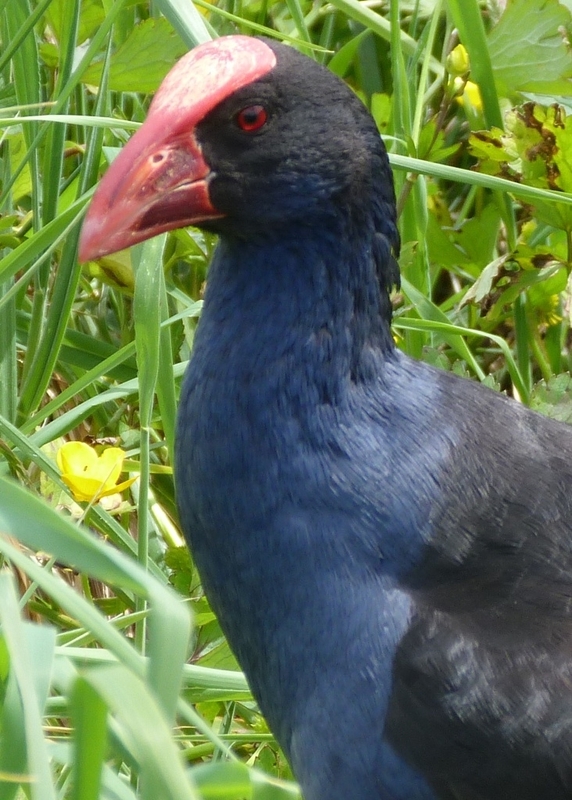 The park is home to a sizeable population of the beautiful Purple Swamphen. The male has an elaborate courtship display, holding water weeds in his bill and bowing to the female with loud chuckles!